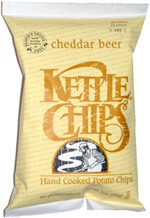 Taste test: Like all Kettle Chips, these were thick, crisp and had a great crunch. They also tasted quite good, with a rich potato taste, but there was just a slight cheddar flavor, far less than many other cheddar-flavored chips, and no taste of beer that we could notice. Smell test: Mostly the good smell of Kettle Chips. A little cheddar, no beer.